Yes, this is Nigma walckenaeri. It is likely to be an old female which has over-wintered rather than a 2019 generation, as you can see very occasionally does happen on the Nigma+walckenaeri summary page. It is a species which matures in late summer and autumn. 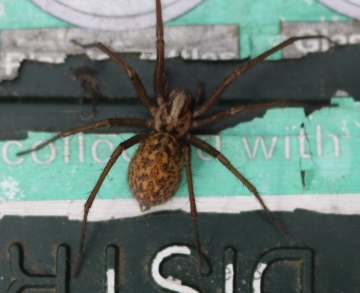 Yes, this is one of the large house spiders. These cannot be identified to species without microscopical examination of adults, and even then separation can be very difficult. 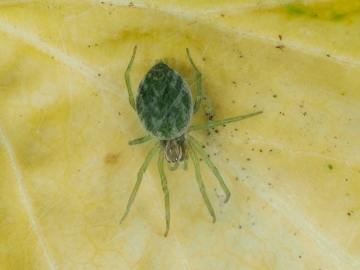 Can you confirm the species of the spider shown. I found it on my garage wall enjoying the evening sun. 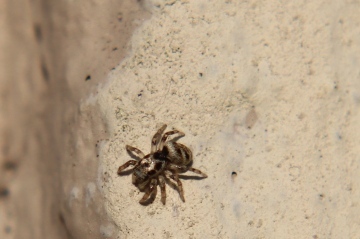 I think it may be Salticus cingulatus but I'm not an expert. We have a lot of these spiders around here, this one was found by my computer this morning. They are mainly hanging around in the garage. It has a white/yellowish band around the base of it's body and some white on the top also, brownish legs.